i had the CRJ 700-900 in december, as a gift for christmas from my daughter and since then i find it impossible to fly with it. Since this morning i made 10 attempt to have a perfect flight, but it doesnt work. plane goes up and down, not stabilizing the speed, not stabililizing the altitude. Trying with the TRIM at 0, 3, 4, 7, 8, impossible to stabilize the trim. either the speed and altitude. i have the CH yoke and there is three ways for the trim.......with the yoke, elevator trim and directly on the yoke side.....i tried all three, same problem. i saw in DAVE the trim is at 7.8........in the CRJ manager at 6.2........on the EICAS 2,... 4.7.........so witch one is the good one. my son got the CRJ 200 and he has the exactly same problem...........i tried it with DAVE information payload, vpeed etc.....tried it all empty.....same problem. tried it without DAVE same problem. tried it with the CRJ MANAGER, same problem............ive uninstall the crj, re download and re install the crj with new update and fixes.........same problem. everytime as ADMINISTRATOR. in my computer. i even took out the antivirus, and also windows defender. i need a big, big help please. The trim in DAVE is the calculated takeoff trim, based on the actual aircraft weights. The trim in CRJ Manager is the calculated takeoff trim. The trim in EICAS 2 is the current trim, which during the takeoff run and for the first few seconds of flight should equal the trim shown in DAVE. As soon as you manually trim, the autopilot disconnects. The normal speed profile is V2+10 until 1500ft and then 250 knots. I usually go from V2+10 to 210 knots first, then change the throttle from TOGA to CLB and retract the flaps. Once that's done, I set the selected speed to 250. I've never had any problems with that. What does DAVE show for CoG (Center of Gravity) for your loadout? so DAVE takeoff trim should be the same as CRJ MANAGER........if i understand..???? are we oblige to trim ??? because everytime i just put one notch down or up the plane goes crazy. Is the plane not suppose to automatically stabilize the altitude ???? Lucien, I think you confuse the CRJ with much more modern aircraft. I do think you trim channels are set to very strange settings though. That is standard FS though, not something special to this add-on. Who don't you take some time to check things out? After all this is an aircraft flown by thousands of people so we know it is pretty okay. Adding a lot of question marks to questions does not make them more valid. Of course the CRJ does that, but it depends on whether your flight settings are correct. Remember that the CRJ doesn't have an autothrottle. It is up to you to maintain the correct speed. I only do one trim adjustment during flight preparation. Then Hands off. This is enough for the whole flight in autopilot mode. Only when approaching manually do I sometimes correct the trim. 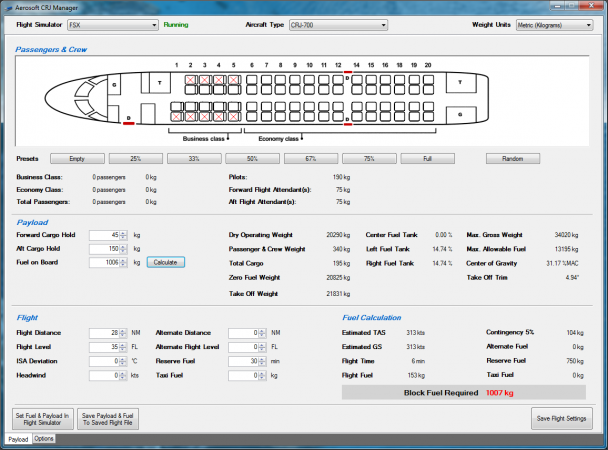 Could you take a screenshot of a flight planning of the CRJ-Manager? yes i understand. For sure i am mixed up. i will try and check what HANS told me because for the plane itself, its superbe, and i like it a lot. i will find the way. and what is messed up with this. for the CRJ MANAGER i dont even follow it because it mix me up , so i just follow DAVE. here is the crj manager screen. and also MATHIJS dont care about your english, me im french from montreal and i make many, many, mistake to let people understand me when im writing in english. Lucien, good to read that you're making progress. But I wonder where you get the information for DAVE from, because the image from the CRJ manager contains practically no data for a flight. If you really want to fly without passengers, practically without cargo and fuel, I'm not surprised about your problems. With an empty airplane the reactions are naturally very direct. Have you flown the tutorial flight from the CRJ documents folder? about 26 miles. so more faster to test. at first ive let it like it was originately, but then i tried to change it and put it nearly at zero. yes i saw the CRJ document about the tutorial flight, but then i was discouraged and let it down. i use SIMBRIEF for my flights, and even if i try to enter another route for YYZ it doesnt work , always LOAD ERROR. also ive checked in the PILOT ROUTE LIST in the fms and the route is there, but when i clic on it LOAD ERROR. ive read the instructions in the FMS documentation but that doesnt really help. and it worked...........so the problem= SIMBRIEF ITSELF. but didnt saw it, but i knew were it was, so i took it manually and i land a bit before the runway. thats ok for me because sure i need practice. witch one first......or both....DAVE or CRJ MANAGER. taken the time to ask before passing two months without flying the CRJ. so happy now. i will tell this to my daughter because she gave it to me as a gift for last christmas.. Please be patient, our people deserve a Sunday off now and again. Also, in the future we would appreciate you making one post per separate issue, as this will help people who read the posts in the future, especially when they chose to search our forum for answers to specific issues. I will answer one or two of your questions now, and one of the CRJ Experts will answer the others (likely tomorrow). I just did a flight and it worked perfectly. Did you first load the CORoute in the Secondary Flight Plan per the instructions and tutorial? I hope this gets you sorted out my friend. thank you again, just made another flight from CYUL to KBOS , no problem at all , all perfect and also as autolanding. Happy you have this resolved.